Beijing is the capital city of China. It is a huge city with 21 million inhabitants. One of the biggest cities in the world. It is flat and perfectly squared out. Beijing’s region has been inhabited by mankind for 500,000 years. Since ancient times, it has been considered a linchpin in defence of the Northern borders. It became the capital city of China for the first time in the 10th century. Since then, it has been the country’s political centre. Beijing is the only city in the world which has 5 monuments that have been declared world heritage sites by UNESCO: the Great Wall, the Forbidden City, the Summer Palace, The Temple of the Sun and the Beijing Man Site. Tiananmen Square is the biggest square in the world with its 40 hectares as well as the geographical centre of Beijing’s political and tourist life. A required tourist site for all foreigners it is always a lively place. Tiananmen Gate is situated in the northern side of the square while the Zhengyangmen Gate is in the south; the Chinese Revolution History Museum is situated in the eastern side and the Great Hall of the People (the Parliament) is in the west, both built in 1959. Mao Zedong Mausoleum and the Monument to People’s Heroes are situated in the middle of the square. 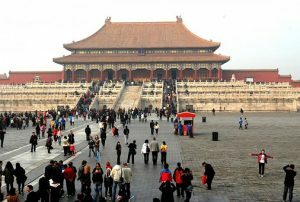 The Forbidden City was the imperial residence during the last two dynasties. It is considered the biggest palace in the world with its 9,999 rooms. It is surrounded by a wall and it has a 50 meter wide moat. It is recommended to start the tour from south to north. In doing so, you will first encounter the open areas which are the most important ones; then you can visit some of its museums and the emperor and his concubines’ private quarters. The Supreme Harmony Hall, which overlooks a three-storey high white marble terrace, is the most important of them all. The imperial throne is inside the hall. It was the highest construction in ancient Beijing. The Celestial Purity Hall and the Preserved Elegance Hall, used for important ceremonies and imperial exams, are found behind the Supreme Harmony Hall. The back area, in the north, is less interesting, although it has the main museums: paintings, bronzes, ceramics, clocks…The Qianlong Garden is in the eastern side and in the west you will find the concubines’ areas. The Imperial Garden is all the way in the back. There is a small hill known as the Coal Hill. There is an outstanding view from the top where you can view the Old City of Beijing. The Temple of Heaven. It was built in 1420. The emperors used to go there in spring and autumn in order to plea with the god of heaven for a good harvest for the whole country. The Temple has got three main buildings. The Circular Altar, similar to the original altars used by the ancient Chinese when they adored their gods. The Echo Hall, where the emperor showed respect for his ancestors before his prayers. And the Hall of Prayer for Good Harvest, situated on three circular terraces made of white marble with a triple blue-tiled roof. The roof is striking with its lovely assembled beams. The Summer Palace is a huge garden in the eastern side of the city. Decadent and sensual, it reflects the spirit of the Qing Dynasty’s last years. Having been destroyed and rebuilt several times, the present construction was built at the beginning of the 20th century. The monument has a peculiar maze that reflects Empress Cixi’s complex personality who used to spend long periods there. The Palace has two main parts. Kunming Lake and the Longevity Hill. The main buildings are on the lake’s shore where Cixi governed. This area contains the Theater, which symbolizes her life-style, her private chambers and, above all, the Long Corridor which is decorated with thousands of paintings representing scenes of China’s history, mythology, poetry and popular novels. The Marble Boat can be found at the end of the lake and it is said to have been built with money allocated to modernize the navy. At the back, there are copies of the most famous bridges in southern China and the Marco Polo Bridge with its 540 sculptured lions on the handrails. China’s Great Wall is a unique monument in the world. It is said to be the only work made by mankind seen from the moon. This could be true as along its 6,000 kilometer it resembles an open wound in Northern Asia. The Great Wall is China’s greatest work par excellence, archetype of its culture and civilization. Works began on the Wall over 2,500 years ago when a group of feudal lords wanted to protect their lands from the menace coming from the nomadic tribes of the North. You will find the most famous section of the Wall near Beijing: Badaling Great Wall. It is 70 km. away from the city and it is the most visited stretch of the Wall. It makes way between the mountains giving it an easy approach and giving the visitor a chance to admire, both from the top and the bottom, several kilometers of the Wall winding into the mountains. The Wall is wide and fairly high there. What is Qu? The Fermentation Starter For Baijiu! How to use chopsticks – Chopstick challenge!